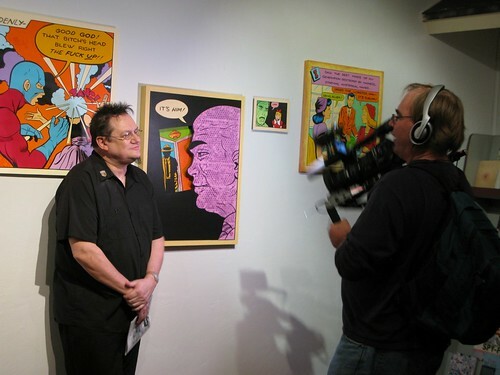 Last Friday I flew to Phoenix, Arizona to attend "The Panelists", an art show exploring the comic-book panel. I had a few pieces in the show, and I thought it'd be fun to meet some of the other artists and get out of the Bay Area for a change. The venue was Pravus Gallery, one of the newest galleries on a small, quiet, and impossibly art-rich strip of Roosevelt St. Almost directly across the street from Pravus is Perihilion Arts Gallery, arguably the center of Phoenix's low-brow, pop-modern universe. Before heading to the airport, I checked out Google Maps "Street View" just to get an idea of what the neighborhood looked like. The photos made the area look desolate, and the buildings where the galleries were supposed to be looked like abandoned dime stores. At least there'd be plenty of parking. I should say that I'm not great at planning trips. For this excursion, I decided it'd be best to just fly in for the night and head back the following afternoon. I'd only talked to the currator of the show a couple of times and didn't really know anyone else in Phoenix, so I figured it might be good to just make an appearance and if I didn't make any friends, then "no big deal", I'd be one a plane the next day anyhow. So the whole trip was going to be less than 24 hours. What I didn't plan for was a three hour weather delay out of San Francisco. This meant that the show was already going on when my plane landed. Having never been to Phoenix, I didn't know how long it was going to take to get to the gallery, etc. In my head, I was counting on that Google Maps image of infinite parking. 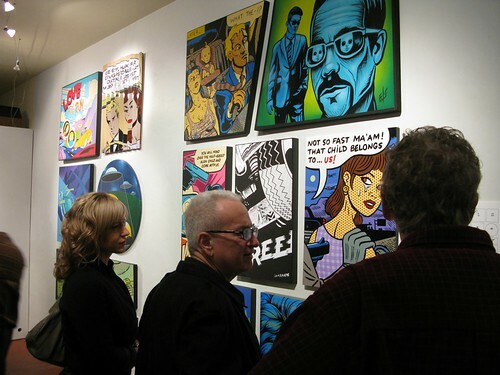 What I didn't expect was the Phoenix First Friday Art Walk. I don't think I've ever seen an art-crawl/block party on this scale. This was highschool-homecoming meets Haight Street Fair with a scent of Burning Man. The warm still air was nice and parking the rental was easier that I thought despite the crowd. 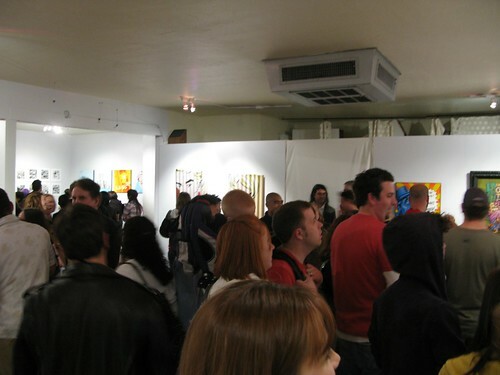 When I got to the gallery, it was already thick with people. The space was great and worked really well with the scale of the art. 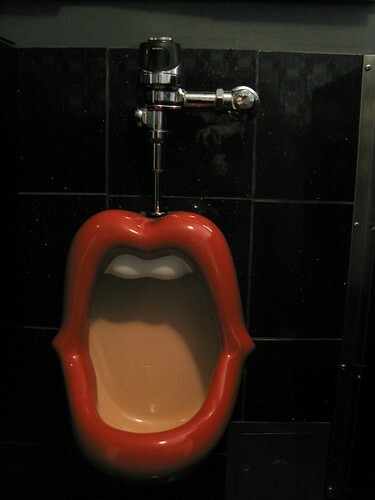 Right away, I found KRK Ryden, one of the artists and currator of the show. He's a Bay Area guy too and we'd met before at comic conventions. He introduced me to a few of the other artists that came to Phoenix for the show. 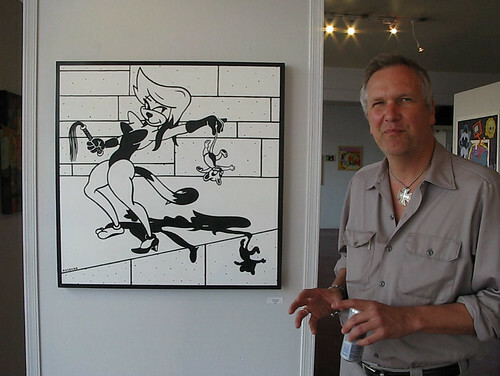 First, I met Anthony Ausgang, an Los Angeles based artist famous for his surreal paintings of cartoon cats. 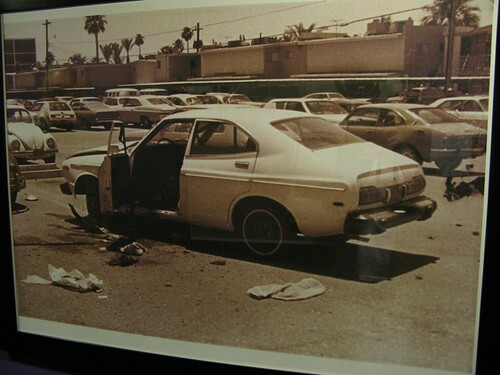 One of his contributions to the show featured a unique use of metallic flecks in the the paint. Very slick work. After talking shop with Ausgang for a while, I was introduced to Mark George and his mother, Judy. They flew all the way from Florida to attend the show. 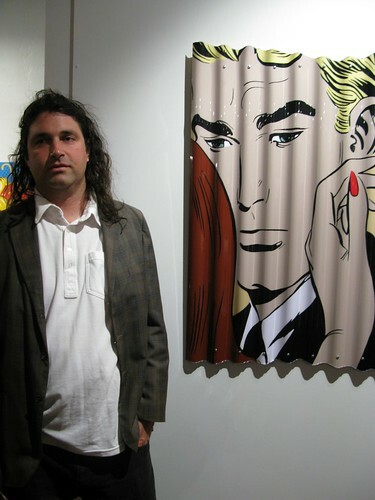 Mark's work really resonated with the Lichtenstein-esque theme of the exhibit. The materials he paints on also added a nice three-dimensional element to the show. 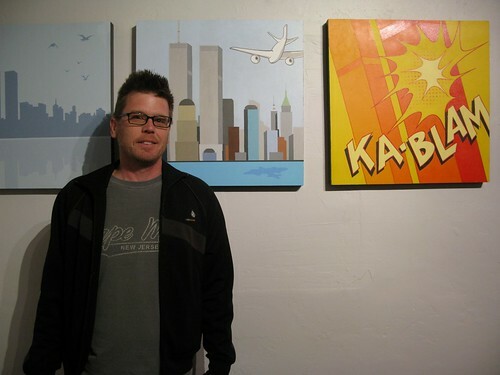 LA artist Zoey Stevens was also in attendence, representing his narrative works. There's a lot of energy in Zoey's paintings, his colors are nuts, and he's got mad B-Boy skills to boot! If you ever run into Zoey Stevens, be sure to ask him about his rave days as a black-light live-painter. Sorry, other people with stories. Zoey's got the best stories. The show was a great success. People seemed to be really into the art. At one point I went over to Periheilion Arts' Scion show and got a Colt 45 to celebrate and came back with a street vendor hot-dog to boot. I really wanted cotton candy but there wasn't any to be found. The afterparty went well into the wee hours of the morning, and after closing both of the hotel bars I retired to my ridiculous suite. Thanks for hooking that up, gallery people! I got a call from Ausgang at 9am for breakfast. I mumbled something into the phone and eventually met him downstairs for luke-warm continental breakfast. We found Mark George drinking Miller High-Lifes in the hot tub. I don't think he ever went to bed. Later, we went back to the gallery to shoot a few more photos and hang out with the owners. Phoenix during the day was beautiful and relaxing. Next to the gallery is an art co-op/bike shop and a local crafts store. I bought a Peruvian foot-bag, a large coffee, and said my goodbyes. The trip back to San Francisco couldn't have been easier. I'll definitely be back to Phoenix for more of that. My thanks to everyone who made the show possible and made the trip memorable.